Ever since I played Assassin’s Creed II for the first time, I have loved the Assassin’s Creed franchise. Though not every game in the series is that great; Assassin’s Creed, cough, Assassin’s Creed III, cough hack, Assassin’s Creed Unity, cough hack snort, I always relish a chance to hone my hidden blade on the flesh of unsuspecting Templars. Now Assassin’s Creed II might be one of the only games I’ve ever platinum medaled on PSN, but it’s Assassin’s Creed Rogue that is the most fun to play. With all the combat improvements that Assassin’s Creed 3 made, Assassin’s Creed IV Black Flag presented a sea fairing world of awesome proportions, RPG elements, and a very well balanced resource economy. 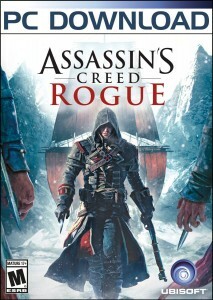 Assassin’s Creed has always been about feeling cool, that and collecting things, and being a pirate is way too much fun, but it was Assassin’s Creed Rogue that delivered the full package for me. With more to do, more toys, and a new spin on the assassin/Templar story, Assassin’s Creed Rogue provided the best Assassin’s Creed experience I’ve played so far. I think the best improvement is the addition of assassin enemies. There is real danger in going up against one of these foes, as they can see you on top of roofs. Unlike other guards, they can hit you from places you’ve never been used to being hit from, and they are devilishly hard to kill. A lot of people bash Assassin’s Creed for being too easy, especially the later ones. “Climbing is just pressing R1 and forward,.” “Combat is just waiting for parrys,” but what people don’t understand is that it’s about feeling like you are a badass assassin. Yes the games traditionally aren’t that hard, and yes its easy to accidentally stick to walls and jump the wrong way which people dislike tremendously, but when you get something perfectly right and the way you intended, it feels awesome. Yes you can climb almost anything by just holding two buttons, but that’s not gonna get you to the top the fastest. If you know what you are doing then you can scale a building faster than anyone else because the climbing system is that in depth. It’s the idea of role playing and the satisfaction associated with doing something well and looking like a total badass while doing it that makes Assassin’s Creed so fun for me, and a lot of the time pulling that off is not so easy. Assassin’s Creed Rogue is the best playground for that concept and it’s a huge playground. That is why it is one of my most favorite games of all time.